I get a lot of people hitting my blog for information on Border Collies. 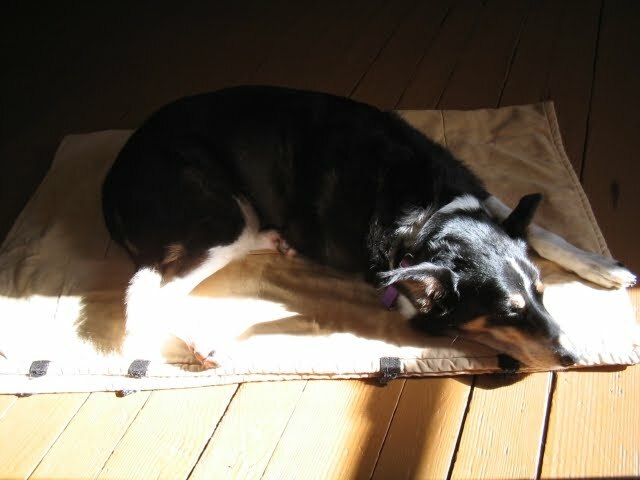 Lately, the series on where my Border Collie, Lettie had her stroke has been getting many steady hits. I thought it would be best to update. It has been a month. My 10 year old Border Collie had a stroke. I woke up and she was wobbling around worse than some of the drunks that go to the bar near the house. She was actually hiding behind the table that morning because she had lost what ever was in her stomach after sleeping all night, peed on the floor and was ashamed. This is from a dog that hasn't peed on the floor since I got her. Dogs can have strokes, and mine had her second. She also recovered from it almost completely. I say almost because while I don't see any obvious symptoms, I notice differences in her personality. Subtle differences, but differences all the same. She is after all 10 years old. She was spry before the episode, and she is now slower, more relaxed. She's also more intensely sniffing around when I have her out on a walk. For years she'd go out, walk on a route, and sniff almost everything but we had a rhythm of a mental three count and then move on. It is possible that while she was sickest, I would have allowed her to sniff more, and I got into a habit of allowing it to happen. One other thing that I have noticed is that she's slower when walking. We have a mile route laid out and she knows it well. She's now walking so that it is more of a stroll. Anyone who has had the luck of having a Border Collie in their life will know that they do everything with energy. Now she's acting older. We are all getting older, so I have to just deal with that. She's also less stable on the floors in the house. Not the floors in the picture, that is 1200 miles away on the third floor of my old house in Philadelphia. The floors here are "Florida Tile". Ceramic tiles with brown grout between them. They are all the sudden, very slick to my dog's feet. She has been sliding out for lack of traction when she runs across the floor. Today she decided that at 4pm, we were going to play. First she grabbed one of the many tennis balls that are around the house, walked over to my left foot and dropped it on it. After going over to the corner that the ball had rolled to she walked back over and dropped it on the other foot. I got the picture and bounced it a few times. She looked like her old self, excited and smiling. Making a grab for the ball I bounced it past her so she could run to the back of the house. The problem is that the body has more horsepower than she expected and she ended up like Bambi with all four legs sprawling out under her body. She did that to stop herself from sliding off the one step into the Florida room. So for the most part she is more mellow than she was a month before. She's taking her time on her one mile walks, three times a day and taking different routes especially in the early morning. She doesn't seem to want to walk as far any more, and in the morning that can be quite a short walk. But they are her walks, so I have let her pick the route for that one. After all, I'm half asleep in the morning too. For the most part she has been acting more and more normal as time goes on. You wouldn't notice the difference, but I do. So do some of the neighbors, but it is going back to normal and not getting worse. Every day with Lettie has been a gift since I got her back around Thanksgiving 2002. She's now in what I call her Bonus Time. This was her second stroke, so it isn't too far fetched to say that it is her third life. She's still cantankerous when she's disturbed or "petted wrong" so there's still fight left in the old girl. As long as she's still fighting, I'll fight for her. If you're interested in reading, you can search for "My Border Collie" here in the search box. You'll get all those stories from a month back when I wasn't sure how much longer she'd last. The stories are also referred to here. For now, she's going to last a bit longer.